Queen Elizabeth II is said to have the largest and most valuable collection of tiaras in the world. She is often seen wearing them on state occasions and her personal collection of tiaras is considered to be priceless. 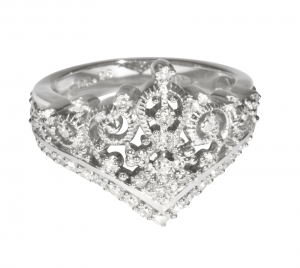 This Tiara ring has been inspired from many of these tiaras taking the best elements from each to create a most majestic Princess ring. For her engagement to Prince Charles in 1981, Diana, Princess of Wales was given a large 20 carat sapphire brooch surrounded by two rows of diamonds as an engagement gift by Queen Elizabeth the Queen Mother. Inspired by a brooch with a central oval pink topaz with a scroll broder of cushion-shaped diamonds suspending a detable topaz and diamond drop mounted in silver and gold and mad ein about 1860. These earrings are based on the design from the Cambridge Lovers Knot Tiara. Queen Elizabeth II is said to have the largest and most valuable collection of tiaras in the world. This ring is inspired from a tiara mounted in gold in the form of stylized flowers decorated in diamonds in siver settings. These earrings are inspired from a necklace worn by Princess Diana on many occassions with either an emerald or sapphire drop. This necklace is based on the design from the Cambridge Lovers Knot Tiara.